Beginning in 1966, China witnessed an extraordinary explosion of violence across the perpetrated by young middle and high school students. Teachers, intellectuals and other “enemies of the state” were dragged from their homes, savagely beaten in the streets, tortured, and summarily executed by these children. This chaos unfolded with the blessing of Mao who exploited it to seize power after being pushed aside following the tragic Great Leap Forward that caused tens of millions of people to starve to death. His deliberate intervention in the movement helped shape the identity of the Red Guards, validating their appropriation of the Red Army uniform and the militaristic adherence to Mao Zedong Thought. To understand the significance on Mao’s influence on the sartorial choices of the Red Guards, one needs simply to examine propaganda prior to his receiving the Red Guards in Tiananmen Square. In this poster, the title reads “Criticize the old world and build a new world with Mao Zedong Thought as a weapon” and it is from September, 1966. 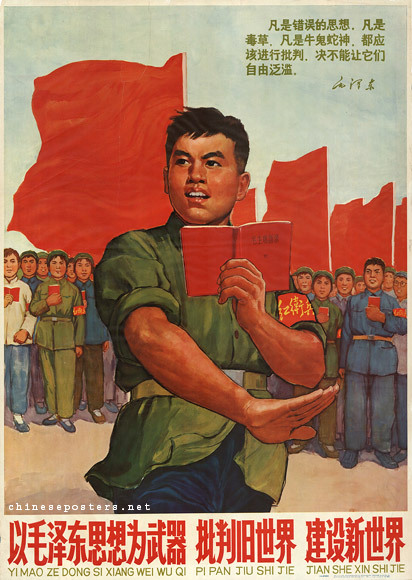 In the center of the poster is a young man who is wearing a green People’s Liberation Army jacket with the sleeves rolled up with blue pants and the typical red armband and carries Mao’s Little Red Book. Behind him are young people in varying outfits: some are wearing completely PLA uniforms, while others are wearing only partial uniforms like the green jacket without matching pants; others are wearing blue Mao PLA suits or plain shirts and pants. Behind them are large red banners. The discord between this image and the legions of identically dressed youngsters clad in PLA uniforms can be resolved by noting that this image was produced in September, 1966. Mao only appeared clad in his olive PLA uniform on the gates of Tiananmen Square on August 18, 1966. 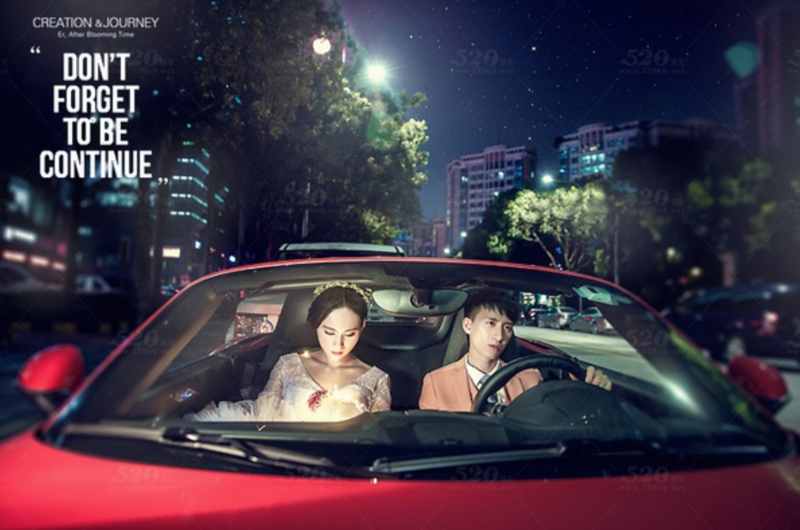 This early in the movement, it is very possible that the Red Guards as a whole had not coalesced around that form of dress even if the elite members from Tsinghua already dressed that way. Instead, careful analysis of the image reveals that they conceived of two unifying symbols: Mao’s Little Red Book and the red armband. Despite their being dressed differently, each person holds a Little Red Book. More importantly, the artist has configured each person so that the book is over their heart. Subtly, the artist wishes to state that what defines the Red Guards at this moment in time is not what they wear, but that they take Mao’s words to heart and always carry his words with them. yes, the poster intends to address that mao’s little red book, thereby mao’s thoughts, is the leading rhetoric for the CR. 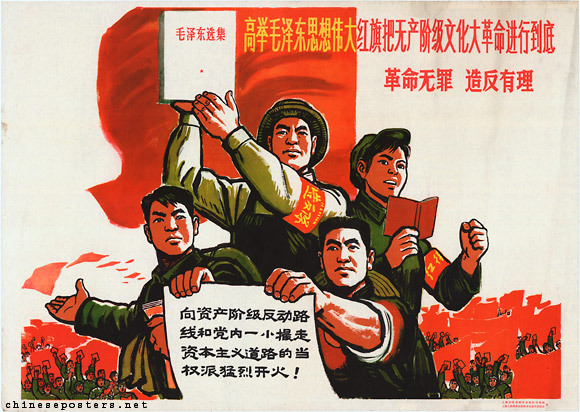 Less than a year later, the Party produced a poster titled “Hold high the great red banner of Mao Zedong thought to wage the Great Proletarian Cultural Revolution to the end – Revolution is no crime, to rebel is justified.” The poster prominently features two red guards in the center wearing the characteristic olive military uniforms of the PLA. The Red Guards holds a copy of Mao’s Little Red Book in her hands and wears an armband on her left arm. Between them are two peasants who are also wearing red arm bands, as well as overalls and sun hats. Behind them are legions of Red Guards wearing the military uniforms and holding Mao’s Little Red Book high above their heads. workers, peasants, soldiers, and red guards are the social political subjects of the poster, thereby the focal point. One must note the significance of placing two peasants between the two Red Guards. The Cultural Revolution and its Red Guards were predominantly an urban phenomenon in China. 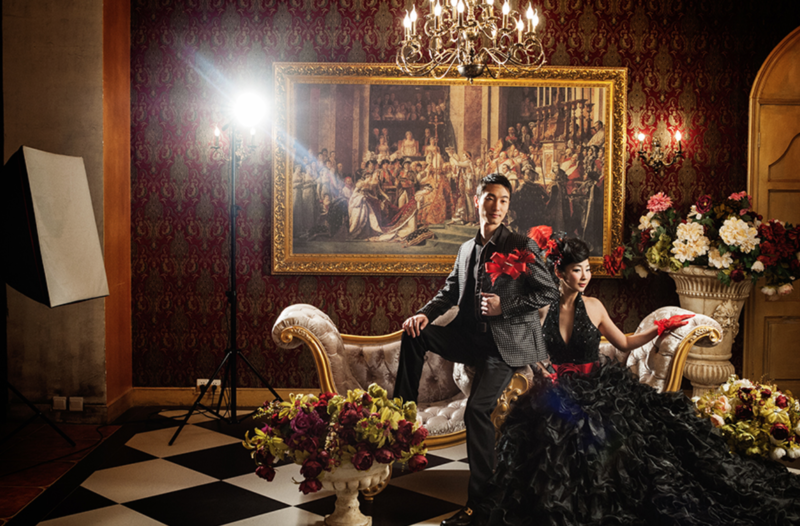 To place two peasants between them symbolizes the unity of the two important segments of Chinese society. Furthermore, this is supported by the peasants’ wearing of the red armband. Not only their location in the image, but the sartorial choices made by the artist are intended to illustrate ideological harmony between the two. Lastly, one should emphasize the sartorial uniformity of the Red Guards in the background. When comparing it to the preceding image, the Red Guards in the background are all wearing olive military uniforms. Contextualizing this difference with the date disparity between the two – 1966 to 1967 – illustrates that the movement quickly coalesced around the olive green military uniform with the red armband as the proper uniform in just a few months. 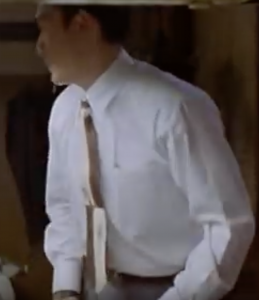 Perhaps this might be due to the influence of Mao’s appearing at Tiananmen Square several times in the span of a few months wearing this exact uniform. Their desire to emulate his thought might have been augmented by their desire to emulate his person. This entry was posted in Fashion and Gender in China, The Socialist - Mao suit on March 25, 2016 by ribanez. Although Western powers were able to secure enormous concessions from the Qing emperor during the latter part of the 19th century, there was no doubt among the Chinese people in the preceding years that absolute authority rested with the imperial state. For much of the Qing dynasty, power rested in the hands of an emperor, not an empress. His clothing, the dragon robe, was replete with cultural symbols that signified his absolute sovereignty over the state. 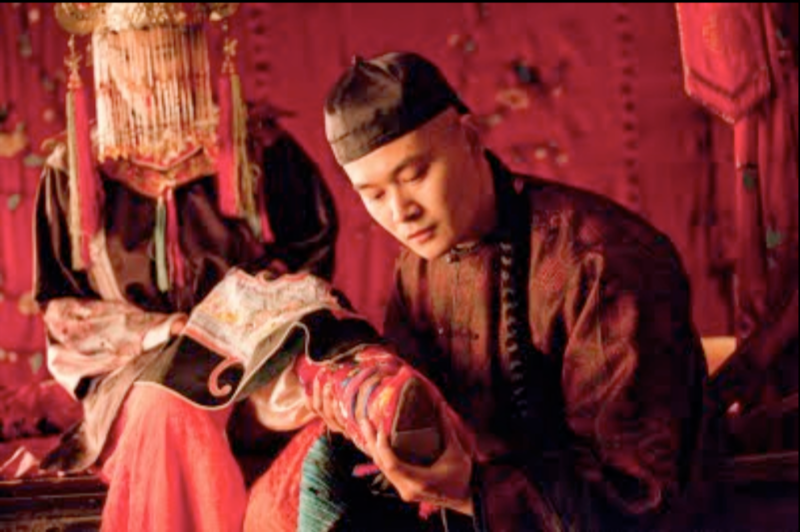 However, power shifted from men to women during the reign of the Tongzhi and Guangxu emperors because both of them ascended while still children. Real authority rested with their mother and aunt respectively: Empress Dowager Cixi. This paper will compare the robes of earlier emperors and empresses with the qipao worn by Cixi to reveal how cultural symbols reserved for the male emperors came to be incorporated in Cixi’s robes. Artist/maker unknown, Daoguang Period (1821-1850), c. 1840, reproduced from ArtStor. This first image is a picture of the emperor’s dragon robes. When comparing them with the empress’s dragon robes below, one can immediately note the color difference. Culturally, yellow is associated with the earth and symbolizes the center of everything. It is fitting, therefore, that the male emperor of China be clad predominately in yellow. His dragon in the center of his chest is one of nine that harken back to the Huangdi Emperor, also known as the Yellow Emperor, who brought order to China through literacy. While the individual characters may say longevity or judgment, together they refer to the imperial literary tradition of enlightened rule inherited from Huangdi. The prominent number of clouds, as well as the sun, stars and moon symbolize his connection to the heavens as the Son of Heaven, tianzi. Artist/maker unknown, Qianlong Period (1736-1795), c. 1740, reproduced from ArtStor. 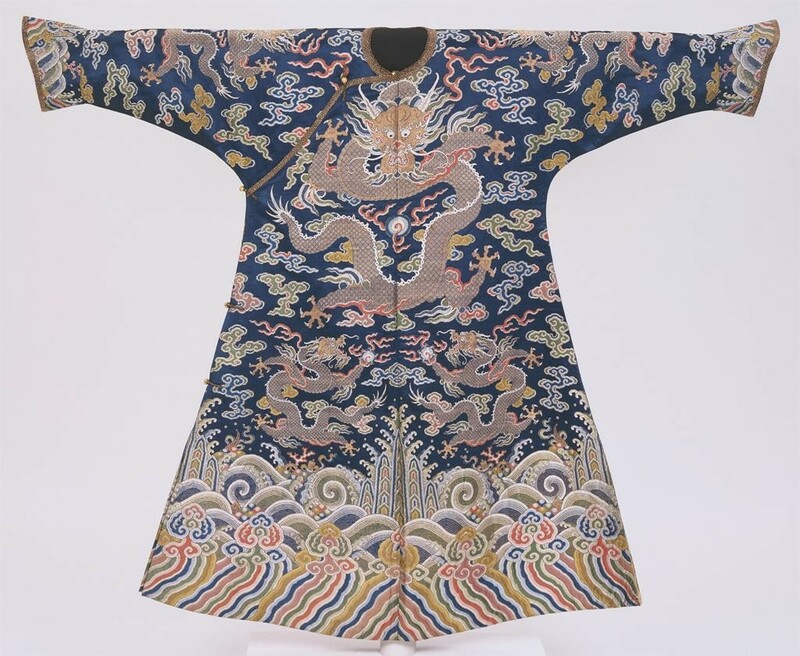 In contrast to the emperor’s dragon robe seen above, the female dragon robe makes limited use of imperial symbology. Most prominent is the limited use of the color yellow, which underscores that it was a color out of reach of even the most powerful woman in China. Furthermore, her dragons are brown rather than yellow. This underscores that men, not women, were the only ones who could claim affiliation with the great Huangdi. She has far fewer clouds on her robes than a male emperor, which signifies her distance from the heavens as only men can hold the Mandate of Heaven. Lastly, her robes lack the writing seen on the emperor’s robes. Recalling that this writing had three connotations – judgment, longevity and enlightenment – their total absence suggests imperial disregard for those three virtues even for an empress. 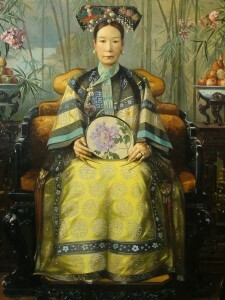 Oil painting of Empress Dowager Cixi by Hubert Vos, 1906. As this painting of Empress Dowager Cixi by Hubert Vos in 1906 demonstrates, Cixi’s robe is a dramatic departure from those of preceding centuries, which symbolizes her transcending traditional gender norms. It is important to note that Hubert Vos was tasked with making official portraits of Cixi, one of which still hangs in the palace. Therefore, his paintings are intended to be faithful portrayals of her likeness. 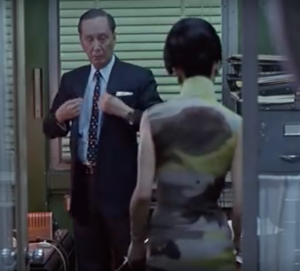 It is also worth emphasizing why it is more appropriate to refer to her garment as a qipao rather than a dragon robe: there is not a dragon on it. Furthermore, it lacks the many of the traditional symbols – clouds, stars, mountains, sacrificial cups, among others – that characterized centuries of imperial robes. 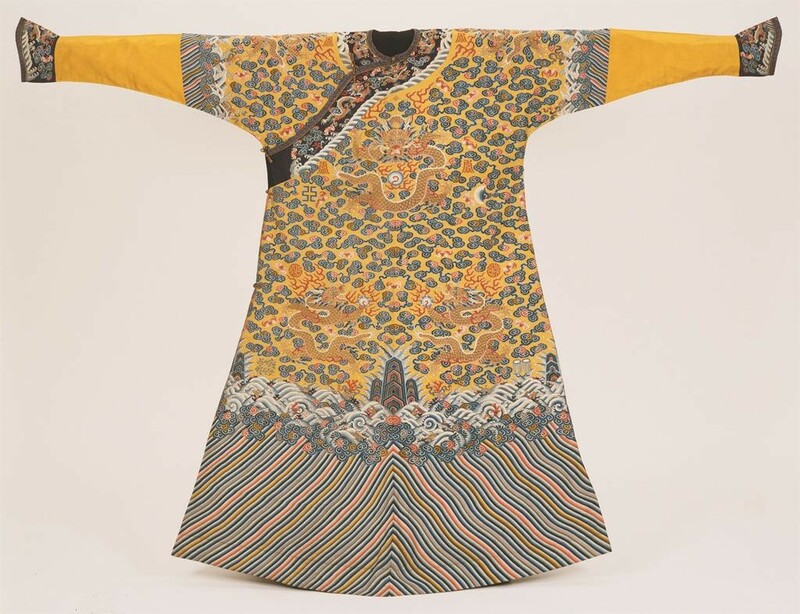 Wearing a qipao in this style rather than the dragon robes appropriate to an empress during the Qianlong era symbolized her autonomy over her clothing and China by extension. Nevertheless, Cixi did clearly appropriate elements of the male dragon robe for her qipao to underscore her authority. The most striking comparison with the dragon robe worn by most empresses is the enormous use of yellow in her qipao. Her symbolically appropriating the color of earth, over which a man normally reigned, illustrates her supremacy over the state. Furthermore, her robe prominently features characters symbolizing longevity. As illustrated in the previous dragon robes, writing – which connoted judgment, longevity and enlightenment – was reserved exclusively for men. By incorporating them on her robe, she stakes claim on those three connotations as though to say that her reign is one characterized by enlightenment, justice and stability. However, the sheer number of the symbols of longevity on every portion of her robe symbolizes her desire to reign as long as possible to ensure a stable, prosperous China. Her renewing the traditional qipao rather than the dragon robe might also have historical significance when one considers the events during her reign. During this time, the dynasty was forced to make more and more concessions to foreign powers at gunpoint. They introduced opium to the population, which crippled their ability to resist. These foreigners secured extraterritoriality, allowing them to evade imperial justice for their crimes. In these times of weakness for the Chinese state, wearing a cheongsam might have been Cixi’s longing for the era where Manchu women were the foreigners who were conquering a weak Chinese empire rather than being the ones conquered by foreigners. nice work, the claim is well supported. This entry was posted in The Modern - Qipao on March 3, 2016 by ribanez.